Social Media Marketing: The Most Effective Tool For Business Branding! HomeBlogDigital MarketingSocial Media Marketing: The Most Effective Tool And A Must For Your Business Branding! You have a business and you need good returns from it! Yes, that’s exactly what we expect from any business we are conducting or willing to start! To garner good results, we need to market the business effectively and reach out to our potential customers. How do we do it? We do it through offline and online marketing. Where offline marketing is an age-old concept, with limited reach, online marketing is catching up, for the widest reach it offers, and hence, the business returns. A big chunk of online campaigning is captured by Social Media Marketing, given the fact that in the current days of evolved networking, almost everyone has a presence on social platforms, young, old and kids alike. It is already the big thing businesses are talking about, to establish their brands amongst the masses and the classes. As per the recent statistics obtained from a renowned social media examiner, 97% of businesses are active on social media and reaching out to people far and across borders! This clearly indicates towards the huge potential of social media marketing, and how businesses are benefitting with sales and profits, using this tool. The more is the engaging content on your social media page, more is the visibility and thus more you get the business. Social media networks come in handy to project your content, products, and services and help them reach across borders, in the shortest possible time. They become the platforms for your voice where you can talk about your brand to new and existing customers, without reaching them physically. Also, an enhanced presence on multiple social networks makes sure that you reach out globally, and garner the attention of potential client base while establishing your brand simultaneously. This is a proven strategy that the businesses that engage their customers on social media, enjoy a better loyalty from them. 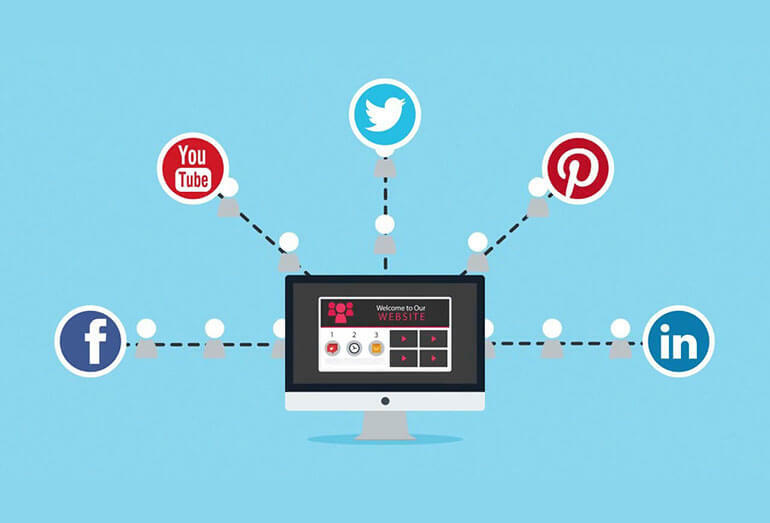 Social media platforms are the most entertaining and informative channels to connect with the clientele and keep them apprised of the business activities and latest offerings. A well-spun social media strategy is the best tool to convert consumers into brand-loyal customers. When people follow you on social, they are more likely to come back to you for products and services, every time there is a need. Yes, this is absolutely true. When you have already created a fan base, every post you are making is an opportunity to promote your business and attract customers. A blog post, a video, a visual post or an informative status update, each and every piece you put on these platforms, speaks about your business and increases the probability of business conversions. Just like advertising your business efficiently, but in the most inexpensive way. One of the most striking benefits of social media marketing is the increase website traffic. When users see a social media post and they react to it, they become curious and go back to your website to get more information. And that’s how, traffic is elevated, and so is the business. Not only that, the more people share your post, the higher ranking you get on search engines. When people will Google something related to your business, your page will show up immediately! You have a presence on social media, so has your competitor! Here, it helps you to keep track of their latest activities and thus you can stay ahead in the competition. Key information on your competitors business activities help you to make strategic decisions. You can always improve your business by offering product and service enhancements, content variations and engaging posts that your competitor might be missing. Thus, increased business conversions for you. Through social media, you have the greatest opportunity to build long-lasting relationships with your customers and keep them hooked to your business. Little giveaways, effective dialogues offering immediate solutions, and productive interactions that are facilitated by a social media page, go a long way in developing and improving on your bond with your customers. The human touch is always welcome. All in all, social media is a treasure trove of benefits in actual sense, which holds all the tools to make your business shine. Having a presence on social media means having business conversions as soon as your business comes in existence. So, are you ready to reap the benefits of social media and establish your brand?